IRELAND IS STILL liable for daily fines of €12,000 for failing to comply with EU rules on septic tanks, because the Environmental Protection Agency (EPA) has not completed its inspection plans. 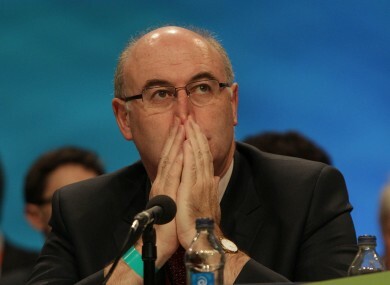 Environment Minister Phil Hogan had claimed on RTÉ Radio1′s Morning Ireland radio on Tuesday, 15 January that Ireland was already in compliance with the December ruling of the Court of Justice of the European Union. But the Department of the Environment has confirmed that the EPA has not yet submitted its septic tank inspection plans to the European Commission. The Commission must approve the EPA’s plans before the daily fines will stop. A spokesman said Ireland was compliant in terms of transposition of the relevant EU legislation into Irish law, but that approval of the EPA’s inspection plans would be “the final piece of the puzzle”. A spokeswoman for the EPA said the report was due to be submitted either next week or the week after. However, on 15 January, Minister Hogan had claimed that the inspection report would be presented to the EC by the end of the following week. That would have been 25 January. In December, the Court of Justice of the European Union hit Ireland with a €2m upfront fine, as well as the daily penalties, for failing to comply with a 2009 ruling that it had failed to fulfil its obligations on wastewater disposed of in septic tanks. The court also fined Ireland €1.5m for failing to properly implement rules on environmental impact assessments. Septic tank inspections are needed in Ireland to protect against pollution to groundwater, which could pose a threat to human health and to the environment, said Andrew Jackson of An Taisce. Just ahead of the February 1 deadline for registration of septic tanks for inspection, just over three quarters of relevant homes had signed up. Only three other EU member states have ever been fined for failing to comply with court rulings on environment law. Email “Ireland still paying €12k-a-day fine for septic tank compliance failure”. Feedback on “Ireland still paying €12k-a-day fine for septic tank compliance failure”.